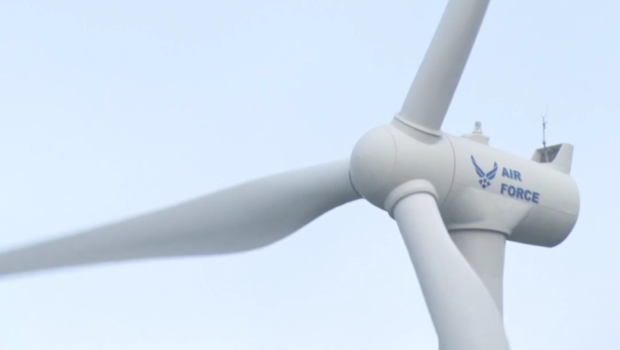 The US Department of Defense’s (DoD) first wind-powered microgrid is nearly ready at Otis Air National Guard Base on Cape Cod, Massachusetts. Unveiled on August 29, 2018, by the 102nd Intelligence Wing and project partners, the “grid-connected microgrid” will serve as a model for similar Air National Guard and Department of Defense (DoD) projects. 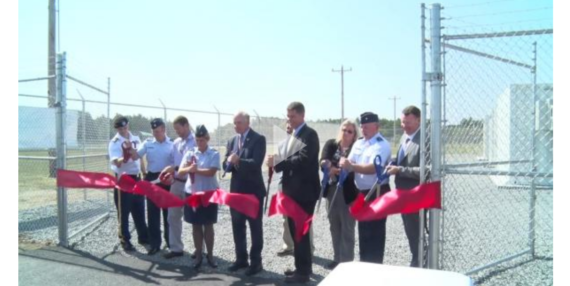 The Otis microgrid is expected to achieve several firsts in microgrid development for the military and New England. A ribbon-cutting ceremony signified how the Otis microgrid — almost exclusively based on renewable energy — will provide for an energy capability while ensuring a high-level of grid security. The Otis microgrid offers economic benefits to both the base and the regional grid by participating in a utility demand-response program and ISO New England’s frequency services market. The energy storage and management system will demonstrate the economics of stacking multiple, battery-based energy storage services, while the controller will optimize on-site energy for maximum efficiency. As an entire package, the Otis microgrid increases value to the Air Force and National Guard as well as state and Federal government through revenue and research opportunities for the energy industry. The Otis microgrid project team is in the final stages of installing, testing, and commissioning the various aspects of the battery energy storage system. Next, it will do the same for the wind turbine and remaining microgrid platform components. If all goes well, the project will enter testing in October, including frequency regulation testing with ISO New England. Full commissioning is slated for December. The Otis Distributed Ground Station Intelligence Group/ DGS Massachusetts conducts reachback analysis – near real-time – to combatant commanders by sensing data from U-2, RQ-4, and MQ-9 aircraft for tactical operations. The Cyber-Intelligence, Surveillance, and Reconnaissance Group provides analysis and awareness of the cyberspace battle mission domain for forces conducting operations and defense of the US. Civil engineer and communications aircorp from the 102nd Intelligence Wing Civil Engineering Squadron and soldiers from the US Army Corps of Engineers’ 249th Engineering Battalion worked closely with Raytheon and other contractors to prepare site locations and for installation of the microgrid’s information and communications network: 3.5 miles of overhead, 3-phase AC power lines, 4.5 miles of dedicated fiber-optic network cabling, and 165 new utility poles. In total, some 300 individuals from more than 30 military and private-sector organizations are contributing to the project. The units gained valuable training time and experience as a result, which may become quite valuable as the Air National Guard and DoD begin to explore similar projects at other facilities. The military labor force involved in the microgrid construction reduced costs by $3 – 4 million from the project’s total $8.5 million budget. The team designed the microgrid so that it will pay for itself in 5 years or less and result in an estimated savings-to-investment ratio of 2:1 over its 20-year lifecycle. Raytheon, the project’s lead private contractor, developed the microgrid control system and saw to all cybersecurity, as well as microgrid design, procurement, and engineering. Customized Energy Solutions is responsible for overall microgrid system optimization and participation in ISO New England’s frequency regulation market. C-Power serves as the intermediary for the microgrid to participate in the utility demand response program. Project partners expect the microgrid to net the Air National Guard $500,000-$1 million a year, achieved through energy savings and new revenue. A projected $100,000-$200,000 of that will come from reductions in capacity tag savings, which is the amount utility customers are charged for electricity consumption during peak periods of demand. Savings from participating in an Eversource demand response program is expected to amount to about the same. The Otis microgrid was funded by a $5.7 million grant from the DoD’s Environmental Security Technology Certification Program (ESTCP), established for leading-edge, environmentally friendly energy technology for the military. The state of Massachusetts contributed another $1 million. The Air National Guard will own and operate the microgrid. A dedicated, digital fiber-optic provides the data and communications the microgrid requires. The microgrid network — which isn’t connected to any Air Force information, communications network, or the public Internet — offers a highly secure, dedicated connection to ISO New England. That’s essential for the Otis microgrid to participate in the regional grid manager’s frequency regulation market. The Otis microgrid is latest among several military microgrids underway as well as an emerging trend for microgrid development on Cape Cod. Two other local microgrids are in progress. The town of Sandwich is also looking toward construction of a microgrid, having received funding from the Massachusetts Clean Energy Center earlier this year.